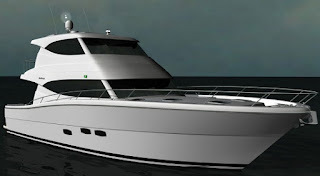 Maritimo present the project for a new M59 for its cruising motor yacht line. This three cabin, two bathroom vessel will comfortably sleep eight people and features the full beam master suite the new generation of Maritimo cruisers are famous for. A wider beam adds to the overall spaciousness. The M59 also features a tender garage, an unusual feature for a flybridge motor yacht of these dimensions. Power comes from standard twin Volvo 725hp with optional choies of 800 or 900hp units.